Mecum holds two motorcycle auctions in Las Vegas every year. The January auction (read about it here) is the big daddy and the June auction, while smaller than January, still packs in a lot of amazing bikes and, some would say, much better values for buyers. While I didn’t make the fear and loathing road trip for the June auction, watching the action on the live stream provided by Mecum and browsing the results gives a pretty good idea of what went down before the gavel hit the wood. Special constructions (bikes built from scratch) did not fare well at the June auction. This 1999 Captain America (offered without a reserve) got stolen for $5,500. That’s gotta hurt if you spent six times that to build the bike. The buyer should be able to flip this and double the selling price. A 2008 NCR Ducati Mike Hailwood TT raked in $77,000. The price got the bike into the auction’s top ten. Sellers don’t have to sell their treasure if they are not getting the price expected. 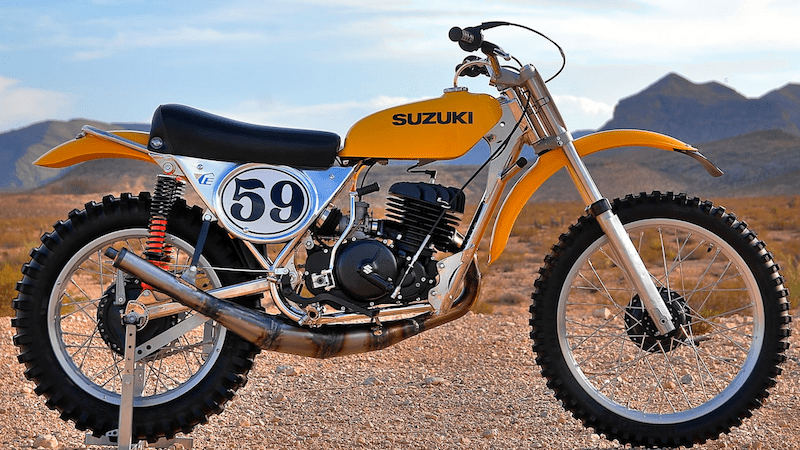 This stunning 1974 Cheney Suzuki TM400 was bid up to $22,000. That bid didn’t breach the reserve so you still have a shot at this. I could see this flirting with $50,000 if the right people were in the pit. The top ten sales were dominated by bikes made before 1960. My theory is these are the bikes snapped up by collectors. When prices drop below the $15,000 mark, the bikes are taken home and ridden. Most of these will end up on display. Bidding stalled at $3750 for this 2002 Titan Coyote. The wheels probably cost that much. The seller was smart enough to set a reserve. Special constructions didn’t spark much excitement out of this crowd. Japanese works bikes (limited-edition bikes handmade for factory racers) are a strange breed that sometimes come with questionable DNA (how did they go from factory ownership to a private party?). This one is still on the block after reaching $34,000 in bids. This 1956 BSA Gold Star flat tracker didn’t exceed its reserve with the last bid hitting $26,000 so it could still be yours. If I had owned magazines (and motorcycle companies) instead of working from them, this would be in my garage right now. It is always cool when race bikes are backed up with race photos from back in the day. Even with this much salesmanship, 12x didn’t make it off the block. This bike was owned by Brian Deegan at one time and built by Jesse James. Even with all the name dropping, the seller must be kicking himself for not setting a reserve. It sold for a very low $7,150. The $8,800 price was pretty good for this unrestored Harley-Davidson 250. I raced one of these once and it felt just like my Suzuki RM250A model. The problem was, the RM250C model was out by the time this got released. Commanding $25,850 wasn’t enough to break the auction’s top ten but it gets on my top-ten list. How cool are those three exhaust pipes all positioned on the right side? A beautiful Triumph Hurricane X-75.